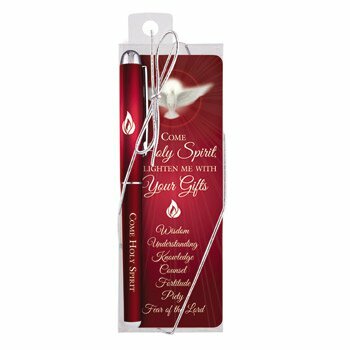 This pen and bookmark set is perfectly priced to be used as a gift or giveaway, and comes nicely boxed with a silver bow for easy giving. Each pen comes with a full color bookmark with the words, "Come Holy Spirit, enlighten me with your gifts" and the Gifts of the Spirit listed on the front, and a Confirmation prayer on the back. 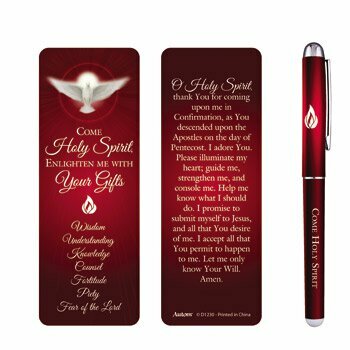 O Holy Spirit, thank You for coming upon me in Confirmation, as You descended upon the Apostles on the day of Pentecost. I adore You. Please illuminate my heart; guide me, strengthen me, and console me. Help me know what I should do. I promise to submit myself to Jesus, and all that You desire of me. I accept all that You permit to happen to me. Let me only know Your Will. Amen.